Pennsylvania Gov. 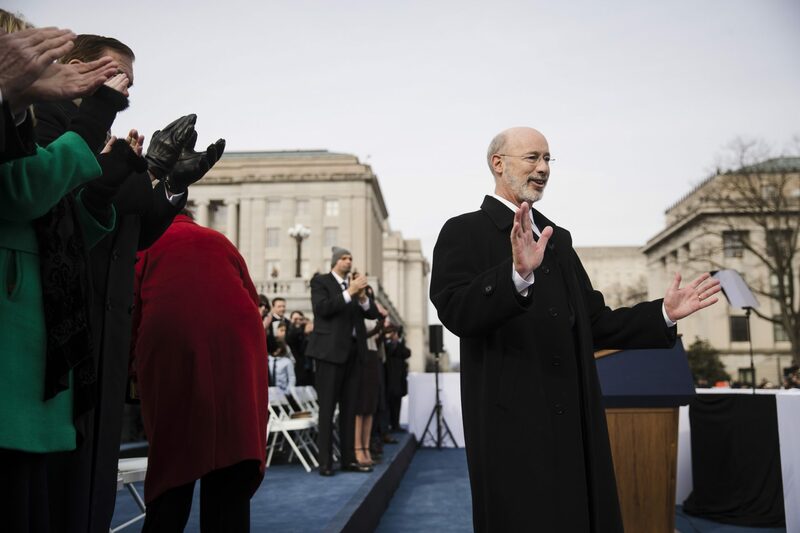 Tom Wolf gestures after he was sworn in for his second term, Tuesday, Jan. 15, 2019, at the state Capitol in Harrisburg, Pa.
At his inauguration, the governor called for politicians to find common ground, for Pennsylvanians to hold them accountable, and for the commonwealth to keep reinventing itself. (Harrisburg) — Governor Tom Wolf’s second and last term is officially underway. With newly sworn-in Lieutenant Governor John Fetterman at his side, flanked by legislative leaders and former governors Tom Ridge and Mark Schweiker, Wolf centered his inaugural speech on Pennsylvania’s place in the country. He called it history’s “crucible” and a commonwealth committed to reinventing itself. And reinvention, Wolf said, is what is called for once again. For one, Pennsylvania’s population is aging. A couple of years ago, a study found that while tens of thousands of young people move to the state after college, even more leave. The trend seemed top of mind for Wolf as he faced another four years in office. Making the state more attractive for young people wasn’t the only thing Wolf indicated was primed for reinvention. The national economy has been on an upswing since Wolf became governor. Budget battles between himself and the Republican legislature are still a near-annual headache, but the state has more money—and more jobs—than it did four years ago. Wolf touted increased education spending, some moves away from tough-on-crime criminal justice, and his expansion of Medicaid. He didn’t delve into any specific policy priorities for his second term, apart from saying he supports reforming “a criminal justice system that treats African Americans and the poor unjustly,” stopping discrimination against LGBTQ people, and making elections fairer. Measures to do all three of those things are expected to come up early in the next legislative session. There is growing bipartisan support for a package of justice reform bills, including measures to automatically parole some low-level offenders and monitor parolees more closely to keep them from re-offending. Likewise, a long-stalled bill to protect LGBTQ people under anti-hate-crime statute may see a resurgence of support, and advocates continue to rally for legislative redistricting reforms. In his own speech. Lieutenant Governor Fetterman gave a few more policy specifics—joining Wolf in his calls for a rehabilitation-focused justice system, he also said the administration is focusing on equitable education and affordable healthcare. More policy specifics are expected to come in Wolf’s budget address February 5th. For an annotated copy of Wolf’s full speech, click here.